On Tuesday 26th March, 50 students from Jo Richardson Community School, Seven Kings High School and Eastbury Community School gathered here to pit their wits against each other in the JRCS Physics Olympics 2019. 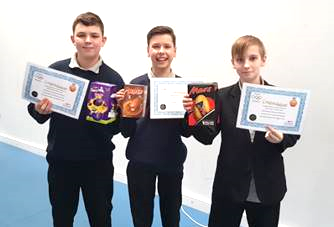 Teams of 4-5 students competed and gained points in a series of challenges, the winners being the teams with the highest cumulative points at the end of the day. Students tried their hand at solving five physics based problems throughout the day, guided and judged by Physics Sixth Form students. Students were given a budget and had to decide how to spend it on various resources in order to construct a bridge. Points were awarded for the bridge supporting the greatest mass and for how they used their budget. Teams used drones to haul a payload over a set distance. The most accurate landing and largest payload carried gained most points. The teams constructed a tower from a limited supply of newspaper and tape. They scored points for the tower height and how much mass it could hold. Teams used available resources to make a catapult. The catapult with the furthest range gained the most points. Throughout the day the teams worked on estimating answers to simple but challenging problems such as: How many days will you sleep in a life time? How many people would need to stand on each other’s shoulders to reach the height of Mount Everest? Well done to all those who took part and to the winners who took home prizes to celebrate their excellent and highly competitive performances at the games.